Arrival morning, formalities, welcome by your guide and start of visits to Hanoi: the small lake of Hoan Kiem with the temple of Ngoc Son. Then, walk through the legendary '36 streets' where shopkeepers and craftsmen are located on the street. After lunch, transfer to the hotel in the center of Hanoi, installation and then, free time to acclimatise. In the afternoon, visit the Ho Chi Minh Mausoleum (outside) and its office house, built on stilts and visit the pillar at the Unique Pillar. Then visit the Temple of Literature, the first university in Vietnam. Overnight at hotel in Hanoi. Departure to Mai Chau, located 150 km north-west of Hanoi. This region has the charm of the large green spaces where the rice fields follow each other. This traditional village consists of about a hundred houses built on stilts. Tour the village on foot to really appreciate all the beauty, calm and serenity of the corner, visit the village Ban Lake and the surrounding. Dinner and overnight in Pomm Coong village. After breakfast, depart early for the visit of Hoa Lu, one of the ancient capitals of Vietnam in the 10th century. Excursion to Thung Nham, a very new site, newly discovered. Visit a bird reserve of very pretty caves, seasonal fruit orchards, a beautiful garden of horticulture and on foot or by bike, visit the virgin forest with trees several hundred years old. Lunch at the restaurant. Overnight at hotel in Ninh Binh. After breakfast, departure by road in the direction of Halong, registered as a world heritage by Unesco since 1994. In the morning, continue the discovery of the bay of Halong. After the brunch, disembarkation and transfer to Hanoi airport. Stop en route to visit the temple of Den Do, dedicated to the Emperors Ly dynasty. Then Hanoi airport and departure by regular flight to Danang. Arrival, reception and transfer to Hoi An. Overnight at hotel in Hoi An. This day is devoted to original bike rides around Hoi An. Our guide will take you to places away from the usual tourist visits, little known places, which retain their charm and authenticity. Departure from the hotel by bike to the fishing village of Van Lang and the 7-hectare Bay Mau water coconut forest, surrounded by mangroves, canals, several stops are planned: the typical local market , Rice fields, schools etc ... Arrival in the village, the fishermen will take you to the discovery of their region by round boat or basket boat. Then, always by bike, we go to the village of the maraichers of Tra Que. There are about 20 types of vegetables and grass including mint, basil, coriander, salad, etc. There is no pesticide used here; Their natural fertilizer comes from a sort of algae collected in the canals. Walking in the village of Tra Que, where farmers tell you about their method of cultivation, the use of medicinal plants and so on. Return, and lunch preparation together with the family: crunchy pancakes, Hoi An Nem, grilled fish in banana leaf. After lunch, relax with foot massage with herbal medicines, a traditional therapeutic practice. Relaxation under the shade of the mango trees, then by bike, return to the hotel. Walk to Hoi An, Vietnamese Bruges with its old merchant houses, its famous Japanese covered bridge and its Chinese pagoda of Phuc Kien. Then, small representation of the local folklore to the theater. Overnight at hotel in Hoi An. After breakfast, free time for your discovery or enjoy the beach and the swimming pool. Then drive to Da Nang. Lunch and visit of the Cham museum, the Ngu Hanh Son marble mountains. Transfer to Hue by passing Cloud Pass. Overnight at the hotel in Hue. After breakfast, start a boat trip on the Perfume River and visit the Thiên Mu Pagoda. Visit of the Imperial City: the Porte du Midi, the Palace of Supreme Harmony, the 9 dynastic urns, the Forbidden Purple City. After lunch, discovery village manufacturing sharp hats and craft village workshops incense sticks. Then visit the mausoleum of the kings Tu Duc and Khai Dinh. Walk in a rickshaw. We end the day with a walk to the market of Dong Ba. Overnight at the hotel in Hue. After breakfast, transfer to the airport and departure by regular flight to Ho Chi Minh, the former Saigon. Arrival, reception and transfer to start the tour of orientation and photo stop in front of the cathedral Notre-Dame, the post office building, outside view of the Reunification Palace, the Municipal Theater. In the afternoon, visit the War Museum, the Jade Emperor Pagoda, the History Museum, Phuong Nam Lacquer, Ben Thanh Market. Overnight in Ho Chi Minh. After breakfast, depart early morning to discover the delta regions. Arrival at the pier, continuation for a nice walk on one of the arms of the Mekong discovering the fish farm, the fish market on this river. Continuation of the crossing, visit of a house of confectionery then continuation towards the small local market Tan Thach. Small horse carriage ride through this small village. Excursion in a rowing tray under the shade of the palm trees. On the way to Ben Tre via the Rach Mieu bridge. Overnight in Ben Tre. Breakfast at the hotel. Drive to Cai Thia. Walk along the Cai Be River to Cai Thia: visit the local church of Cai Thia (outside), the My Luong temple. Stop at the inhabitant who makes rice pallets. Walk to Hoa Loc village. Continue to Sa Dec by traditional boat. Lunch on board. 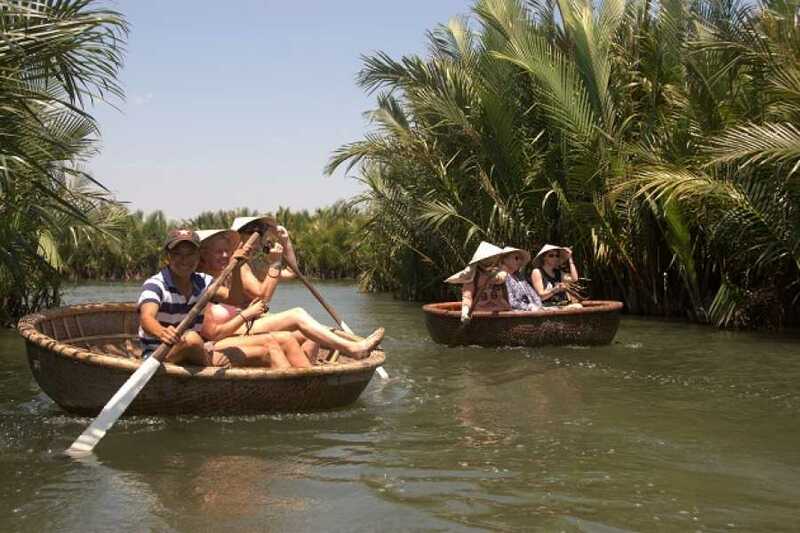 Arrives in Sa Dec, a very friendly little town by the water with its market very typical of the market of the delta, with its numerous sites recognized vestige of the culture of Vietnam. She will remind you of Maguerite Duras' famous novel "L'amant", a real lived story: The market, the school where M.D's mother was taught, the house of the Chinese ... Visit this old house of Huynh Thuy Le. Transfer to Chau Doc. Overnight at hotel in Chau Doc. After breakfast, take a boat trip to discover the cajeput forest, a 900-hectare natural site, renowned not only for its almost untouched natural beauty but also for its flora and fauna. Then visit the temple of the Lady Chua Xu and the Tay An Pagoda. Return to Can Tho with en route to the Crocodile Farm. Overnight at hotel in Can Tho. After breakfast. In the early morning, boat trip to one of the largest and lively floating market "Cai Rang". This market is open all day, activity is in full swing around 06 o'clock, freight boats, small canteen boats, wholesale buyers, in detail, a truly particular culture of the Mekong Delta. Return to ground. And back to Ho Chi Minh. Visit to China Town, a charming neighborhood where you would think you are in a small Chinese city with its small markets, small stalls, pagodas and colorful temples, street medicinal plants. Overnight at hotel in Ho Chi Minh. After breakfast, landing on the Saigon River to reach Cu Chi. Nice boat trip (sharing boat). Visit the Cu Chi tunnels, the refuge of the North Vietnam army to fight against the Americans. Return to Ho Chi Minh for lunch at the local restaurant. Free time for your last purchases. Then transfer to Ho Chi Minh airport and departure.